One of the best ways to create resilience in the face of climate change is to protect and restore mountain wetlands. Our wetlands are the sponges of our watersheds. They store water naturally, then release clean water over time that nourishes communities. Amigos Bravos began work with GIS consultants to analyze, prioritize, and map wetlands in the Rio Grande headwaters for protection and restoration. Wetlands in the Carson National Forest were ranked based on nine priority wetland conditions. Those conditions include cold headwater wetlands that provide stream flow maintenance and carbon sequestration. Eight “Wetland Jewels” were identified. Amigos Bravos, in partnership with Western Environmental Law Center, have begun making plans for how to best advocate for special protections under the Carson and Santa Fe National Forest Planning processes for these crown jewels of New Mexico's Rio Grande headwaters. 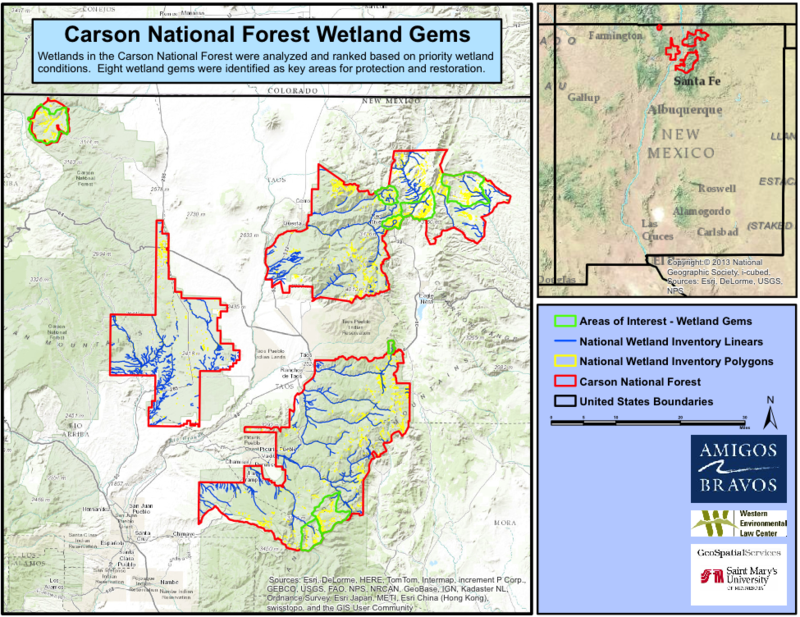 We are currently advocating for "Special Designation" of these wetlands in the Carson and Santa Fe Nation Forest Planning Revision Processes. See our submitted comments below. For more information on these revisions and how you can become involved, visit the links below. 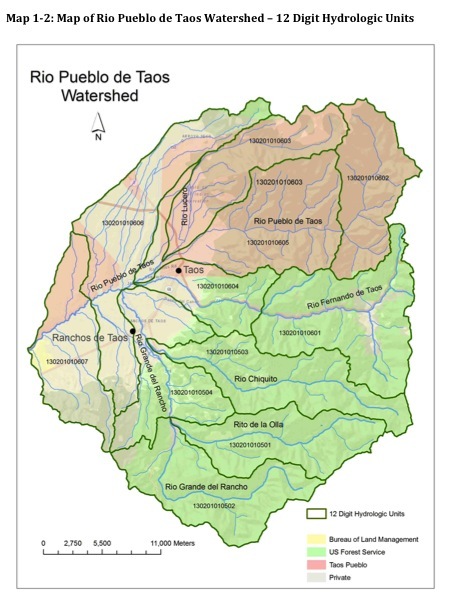 The purpose of the Rio Pueblo de Taos Watershed Based Plan (RPdT WBP) is to provide a roadmap to comprehensive watershed restoration in the Rio Pueblo de Taos watershed. The plan identifies causes and sources of pollution as well as detailed management measure to address that pollution. An implementation schedule is outlined, as are milestones and monitoring mechanisms to help track the restoration process. Successful implementation of this watershed plan will require a collaborative approach and effort. The planning processes for different pollutants as well as for different subsections of the watershed will be completed through separate but connected processes. This planning document attempts to incorporate a framework and space for all of these processes. Funding for on-the-ground work to implement this plan through a 319 grant is currently pending. 2007 Report: Amigos Bravos found high levels of E. coli in the Río Hondo and the Río Pueblo de Taos during the 2007 sampling period. During May 2007, very high E. coli results were obtained from two sites in the lower Río Hondo and two sites in the lower Río Pueblo de Taos. These results exceeded water quality standards that are safe for swimming. All other samples taken in the Río Hondo, Río Fernando de Taos and Río Pueblo met water quality standards for all tested constituents. For more details on this sampling project, please see the '07 Taos Rios Report (204 KB pdf). 2008 Report: All three streams that were monitored (Rio Pueblo de Taos, Rio Hondo, and Rio Fernando de Taos) had E. coli levels above standards. Two of the streams had conductivity readings above standards. All other standards were met in these streams. Based on these results Amigos Bravos has recommend to the New Mexico Environment Department that the three streams be listed as impaired for E. coli in the state's 303d list. For more details on sampling in 2008 please see the '08 Taos Rios Report. 2009 Report: All Samples in the Rio Hondo met water quality standards. Rio Pueblo de Taos and Rio Fernando had E. coli levels above standards on sampling event. The Rio Pueblo and on the Rio Fernando both had conductivity readings above standards. All other samples met water quality standards for all tested constituents. Based on these results, where both the Rio Pueblo de Taos and Rio Fernando had conductivity readings above standards in multiple samples, it is recommended that these two streams be listed as impaired for conductivity. In addition, 2009 sampling confirms the recommendation from the 2008 sampling report to list the Rio Fernando as impaired for E. coli. For more details on sampling in 2009 please see the '09 Taos Rios Report. 2012 Report: Four sites in the Red River were added this year. No water quality exceedances were observed in the Red River. Water quality in the Rio Hondo continued to be excellent with only two slight exceedances of water quality standards (one for pH and one for electrical conductivity). The Rio Fernando de Taos consistently did not meet dissolved oxygen or conductivity standards. While for the first time since initiating sampling in 2007 there were no E.coli exceedances in any of the streams sampled, one site in the Upper Rio Fernando had high levels that were just at the standard. High levels of phosphorus and conductivity were recorded in the lower Rio Pueblo but because there are no water quality standards for this section of the river for these constituents, no water quality standards were exceeded. Water quality in the wastewater arroyo below the Taos wastewater facility was much improved from 2011 samples. It is recommended that the Upper Rio Fernando de Taos be listed as impaired for conductivity. It is recommended that conductivity and phosphorus standards be adopted for the lower Rio Pueblo. For more details on 2012 sampling please see the '12 Taos Rios Report. 2013 Report: One site in the Rio Grande del Rancho was added this year. Sampling showed levels of conductivity above standards and confirmed the Environment Department's previous listing of the Rio Grande del Rancho as impaired for conductivity. All samples in the Rio Hondo met standards. There was an E.coli exceedance in the Upper Rio Fernando. The Rio Fernando also continued to have dissolved oxygen and conductivity exceedances. While no standards were exceeded in the Red River there were levels of Aluminum detected that would have exceeded the pre 2010 water quality standard many times over. For more details on 2013 sampling please see the '13 Taos Rios Report. 2014 Report: Samples were collected from 4 sites in the Rio Hondo, 5 sites in the Rio Pueblo de Taos, 7 sites in the Rio Fernando de Taos, 4 sites in the Red River, and 1 site in the Rio Lucero. June and July samples were taken for the 3 upper Rio Fernando sites in order to measure E. coli levels before and after cattle grazing on the Flechado allotment. Water quality standards were exceeded in the Rio Pueblo de Taos, Rio Fernando de Taos, the Rio Hondo, and the Red River. There were no water quality standard exceedances in the single sample on the Rio Lucero. In May, July and September the Rio Fernando did not meet standards for dissolved oxygen and electrical conductivity. In July, the Rio Fernando did not meet standards for temperature, pH, dissolved oxygen or electrical conductivity. Following grazing in the Flechado allotment, E. coli levels in the upper Rio Fernando exceeded standards. For momre information on 2014 sampling, please see the '14 Taos Rios Report. Taos River and Lands Clean-Up: For the past nine years the community of Taos has joined together to clean up trash along our local rivers, arroyos, trails, roads and illegal dump sites. The 2015 Annual Taos River and Land Clean Up pulled 29.14 tons of waste! This year, with a focus on Miranda Canyon, a large illegal dumping site in Taos, 120+ volunteers pulled over 28 tons of waste from that Canyon and 1.14 tons from 6 other sites around Taos and Questa. 280 pounds of material was recyled and over 1,000 miniture liquor bottles ("shooters") were cleaned up from roadsides. We would like to thank the 21 supporting organizations including Amigos Bravos, Because Water Matters, Taos County Waste Department, Rocky Mountain Youth Corps, AmeriCorps, St. James Episcopal Church, U.S. Forest Service Carson District, BLM-Taos Office, Taos County Sheriff’s Department, Centinel Bank of Taos, Taos Land Trust, Rio Grande Ace Hardware, Randall Lumber, Sierra Club, Holy Cross Hospital, Los Rios River Runners and The Beautiful Midden Project. Click below to see the news clips from KQRE that aired before and after the event. Please click here for the interactive Story Maps. We are currently seeking funds to implement our approved Watershed Based Plan for this area. 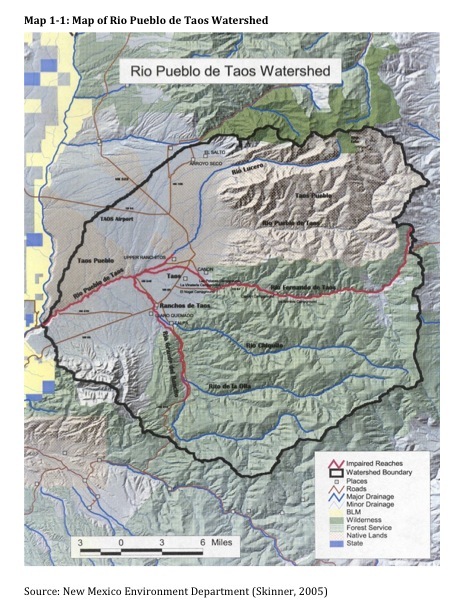 These maps are also available in the Rio Pueblo De Taos watershed Based Plan available on this page.